My heritage is an integral part of who I am and my work. I was born in the French Alps to a Gwich'in mother and a Swedish father. My mother, Shirley Firth, always told me I was Gwich'in and I should be proud of that. She was always my biggest inspiration. She was a trailblazer who broke down barriers and put the Gwich'in nation on the map. She was fierce, loving, kind, intelligent, and strong. She had such determination and mental strength. Whenever she set her mind on something, she would give it 110%. She promoted health, healthy families, and education. She was born on the trapline (her parents were trappers) in the Canadian Arctic; we are from the most northern tribe in North America just before the Inuit. We are the Caribou people, a nomadic people whose lands expand from Alaska to the Northwest Territories in Canada. My mother and her twin sister were the first First Nations women to compete in four consecutive Olympics representing Canada in cross-country skiing. That's how she met my dad, who worked for a French ski company, and why I grew up in France. When I was a teenager I started investigating more into my heritage. I wanted to be able to wear my culture. I thought all my questions would be answered if I moved to the Northwest Territories. So at the age of 15, I decided to move back to Northern Canada to strengthen my connection to my culture, my family, and the land, which have been my biggest inspirations behind my work. I wanted to present myself as a Gwich'in woman and needed cultural indicators that could be worn anywhere, more than just my moccasins, fur clothing, or a beaded vest. That is when I started my journey researching Gwich'in adornments and how to make them today. I researched in museums like the Smithsonian NMAI and the Museum of History in Canada, some private collections, and the books that the Gwich'in nation has produced over the years. I am very thankful to have found a mentor in Keri Ataumbi, who is an extraordinary jeweler. I apprenticed under her for two years and learned how to make adornments with some of the most precious materials available, gold, hide, diamonds, and beads, just to name a few. Then, in my late teens, a very simple goal of mine was to learn how to sew my own moccasins. To do that, I decided I needed to learn how to tan a hide, which was the beginning of a long journey. Being on the land with cultural knowledge holders changed everything. It was more than just the end product. It was about being on the land, being connected spiritually, and it was about sharing. To this day I am still learning about hide tanning, learning protocols, learning about the land, and my people. All of this is what motivated me to pursue my education in the arts so that I could be self-reliant and spend time learning my culture as part of my work. But it was a little shocking to find out that I needed to work really hard to find the answers I was looking for. Understanding the effect of colonialism on my people, my family, and me was a life-changing moment. I had gone from living in France, being treated like my peers as a French person, to seeing the racism against our people when we moved back to Canada. I had to learn about the colonial policies and tactics against indigenous people. What's worst is understanding that indigenous women were viewed as disposable. My feminism is not even worried yet about being equal to men; it's about being seen as a human being that has the right to life, to thrive, and to succeed. If you look at all the stories and statistics of missing and murdered indigenous women in Canada and the rest of the world, there is a systematic disregard for our lives and our bodies. When I succeed in my career, in my projects, and I am promoting other indigenous women, I know I am making a difference. If I can empower a woman to follow her dreams, from learning how to tan hides, or making jewelry, or being an entrepreneur, all my work is worth it. Now, one of my greatest accomplishments has been to fight white supremacy and colonialism by learning and practicing my culture. It took me awhile to understand that learning how to make traditional tools, tanning hides, and making jewelry was fighting policies that were put in place to assimilate me. I have since co-founded, Dene Nahjo, a nonprofit whose vision is "Land, Language, and Culture Forever." Our mission is to advance social and environmental justice for northern peoples and promote indigenous leadership. Along with nine founding members, and an elder's advisory council of four to guide us, we started to meet after the Idle No More movement in Canada in 2013. We decided to get organized and work together because we wanted to be the change in our community. By living, learning, and celebrating our culture on the land through the guidance of elders, we strive to foster emerging leaders, strengthen relationships, and create long-term, positive change in the North. Image by Razelle Benally. Model: MorningStar Angeline. Some of our first work was cultural revitalization projects such as learning how to make traditional tools and learning how to tan hides. Then we organized an Indigenous Circumpolar Women's gathering that built this strong network of women in the North. This was such a key event: As it connected women who did important work in small, isolated communities across the North, it allowed us to know what was happening, what we could learn from each other, and how we could support each other. This year we launched a program that focused on rites of passage for young teens, and we also have an emerging leaders program. In moments of adversity, I build myself back up through my friends and community. I have made friends within Dene Nahjo who have become like family. We are present for each other whenever we celebrate our accomplishments to whenever we are going through hardship. When I lost my mother, they were there in one way or the other, holding me up, giving me the space to be vulnerable in such difficult times. In a society that promotes individualism and capitalism, I am so happy to embrace our indigenous values of community. If I succeed, we all succeed, and therefore it is a pleasure to share the credit with my peers, my elders, and mentors, because without them where would I be? Never will I use the term self-taught artist, because there was always someone along the way who taught me something. We all need to see someone out there in the media that looks like us. For so long, we have accepted the status quo of white aesthetics and white bodies. I'm of mixed heritage, and I want to make sure that I promote our beauty and strength. Whenever I have a photoshoot for my jewelry, I look first for strong people that are talented and then for someone of mixed heritage. I've had artists, writers, actresses, students, hunters, directors, and mothers model my work, just to name a few. I believe that our beauty encompasses more than just a dress size. It is so important to be strong in one's identity. Over the years I've heard people say that I was not brown enough or not white enough, but at the end of the day, I know who I am and where I come from, and it is a lot easier to navigate this world knowing that. My advice? Don't try to fit in; it is OK to follow your own path; along the way you will find people like yourself who are changing things in their own community. Always have people that can hold you accountable and that can encourage you when you are down. My mother always said, "If you know where you come from, you won't spend your whole life looking for who you are." Caribou tufted earrings set on sterling silver with peach moonstone beads, with a diamond set in 18k gold. Born and raised in France, Tania Larsson is of Gwich'in and Swedish descent. At 15, she moved to Canada to reconnect with her culture. 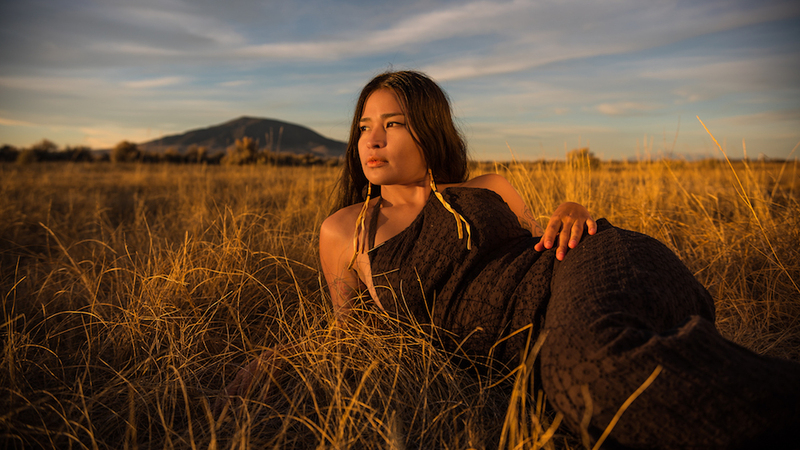 She earned her BFA at the Institute of American Indian Arts in 2017. Tania is a founding member of Dene Nahjo, a nonprofit organization that focuses on cultural revitalization projects. She set up a jewelry studio in Yellowknife, Northwest Territories. She is an artist who works in silversmithing, metalwork, digital, and traditional arts.